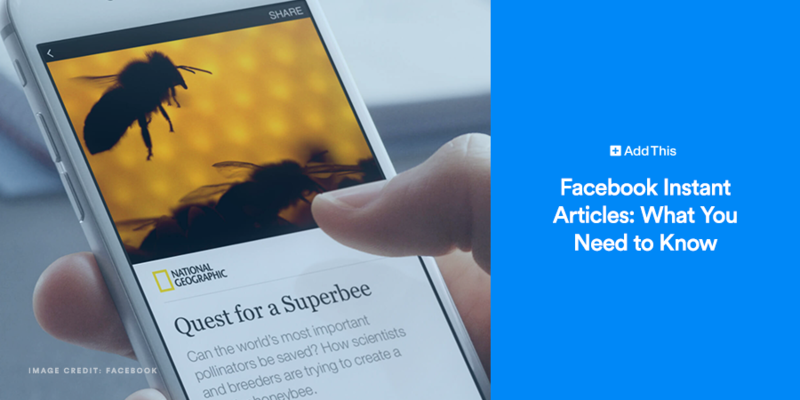 Facebook introduced Facebook Instant Articles (FIAs) to provide mobile device users with a better experience while reading content linked from within Facebook. Content appears almost instantly – typically, in less than a third of a second, as compared with average load times of 3-5 seconds for regular links. The other terrific thing about FIAs is that these articles provide a more enjoyable and immersive experience – with higher-quality imagery, more interactive capabilities (such as panning images by tilting the phone) and other advanced features – which result from FIAs being created in mobile-optimized HTML5 code. Users can easily identify links to FIAs by the lightning bolt icon shown on an article’s image preview. Considering that nearly half of Facebook’s 1.5 billion monthly active users access Facebook strictly through their mobile devices, Facebook is the Web’s number one referrer to news sites – FIAs are obviously a very important development for content publishers and end users alike. The good news is that you don’t need to publish anything additional to Facebook in order to take advantage of FIAs. Facebook lets you link Facebook to your CMS so that articles (and updates) published on your existing platform get automatically pushed to Facebook. The not-so-good news is that the setup process, using RSS feeds or APIs, can be a bit tricky, and will probably require the involvement of your technical folks. However, if you publish content using WordPress, you’re in luck: Facebook and WordPress have published a free WordPress plugin that makes setup much easier for business users. Once you are set up and your feed is approved by Facebook (one notable requirement is that you already have 50 articles ready to go), links to your content on Facebook will appear with a lightning bolt icon. This signals to users that your content will appear instantly, and they will expect it to look and work better than a regular web-link. Learn more about getting started with FIAs at Facebook’s Instant Articles Quickstart Guide. As already mentioned, the best part of FIAs is the much-improved end-user experience. · Consistently demonstrate a 30% higher share rate. Considering that there are no extra steps in the publishing process (once the initial setup is complete), these stats are an obvious boon for any publisher with content that appears for mobile users on Facebook. Increased exposure is another plus: Facebook’s audience dwarfs that of even the largest news publishers. Given that Facebook likes to prominently showcase its latest and greatest features, publishers can expect that Facebook will give FIAs priority in newsfeeds. Since there are no copyright or duplicate-content issues having the same articles on your own site and on Facebook, you can potentially realize dramatic increases in readership and ad revenue using the same piece of content. Another significant advantage to publishers that Facebook is promoting is the monetization angle. Facebook is encouraging publishers to think about monetizing their FIAs from day one, in ways such as running branded content via Instant Articles, pre-roll ads, rich media and their own direct-sold ads (read more about this here). Publishers concerned about losing ad revenue shouldn’t worry: for ads you sell yourself, Facebook lets you keep 100% of the ad revenue (but Facebook limits how many ads you can run). For ads sold through the Facebook network, you keep 70%. On the downside, using FIAs means that publishers will have fewer readers landing on their own mobile websites, with all that implies in terms of traffic, on-site advertising revenues and exposing first-time visitors to everything else available on the site. Publishers may also lament the feeling of not having the total control they are used to over their content and platform. On the technical side, setup can be tricky, as already mentioned. Also, certain features that publishers rely on for showing content on their own sites will simply not work. Examples include custom fields, shortcodes, sidebars, slideshows, email/signup forms and certain widgets and other interactive elements. While all indications are that the pros outweigh the cons for news or media publishers, other types of publishers may want consider the decision carefully. Data and analytics to understand how users are engaging with your FIAs are readily available. Facebook provides its own engagement data, which you can process within your existing in-house analytics tools via API, and you can embed analytics tracking codes in articles to track real-time article traffic with your existing analytics solution. There are also third-party measurement services that can report on your FIA performance. Publishers can earn traffic credit through attribution providers, as well as embed cookies to follow reader interests and serve more relevant ads. Facebook provides more details on these options here. The bottom line is that even though your FIAs will be read within Facebook’s app – readers won’t actually visit your website to be counted in terms of referral traffic – standard Web analytics tools will still be able to track traffic and maintain overall visitor counts.